The number of traffic accidents and casualties declined drastically during this year's Eid al-Fitr holiday, the celebrations that mark the end of the Ramadan month. 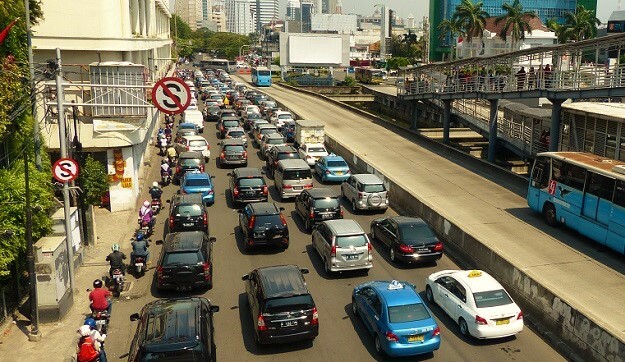 Traditionally, tens of millions of people travel from the urban areas back to their places of origin to spend a couple of days with their families (a tradition known as mudik in Indonesia). This exodus at the start of the holiday (and inflow at the end of the holiday) usually leads to many casualties, primarily because people become tired after driving for many hours. Although figures are still expected to rise, there has been a 30 percent drop to 1,478 traffic accidents during the 2018 Eid al-Fitr period so far (down from 2,110 accidents in the same period one year ago). Around 70 percent of all accidents involve motorcycles (followed by cars and buses or trucks). Drivers and passengers of motorcycles are particularly vulnerable because they lack the protection that is offered by a car. Moreover, in Indonesia it is common for small families (husband, wife and one child) to ride on one motorcycle (while carrying baggage). Fatigue and frustration (the later being easily brought about by traffic congestion) can then lead to accidents and fatalities. Yusri Yunus, Head of the Information Unit of the National Police's Public Relations Division, said the number of fatalities declined 59 percent year-on-year (y/y) to 333 people this year, from 815 last year. • This year's Eid al-Fitr holiday was longer than ever (11-19 June), allowing travelers to avoid traffic peaks (by waiting a couple of days before starting the journey). • New (toll) roads have been opened between Jakarta and East Java, including the Pejagan-Pemalang toll road, Pemalang-Batang toll road, Bogor-Ciawi-Sukabumi toll road, and Batang-Semarang toll road. Better infrastructure reduces traffic congestion, hence reduces traveling time and fatigue. • Indonesia's Transportation Ministry runs a program known as "Mudik Gratis" (Free Mudik) in an effort to reduce traffic accidents. The program encourages travelers, especially those on motorcycles, to use trains, ships and buses, hence reducing traffic congestion on roads.